Air access is now via the centrally-located Savusavu Airport and Labasa Airport. 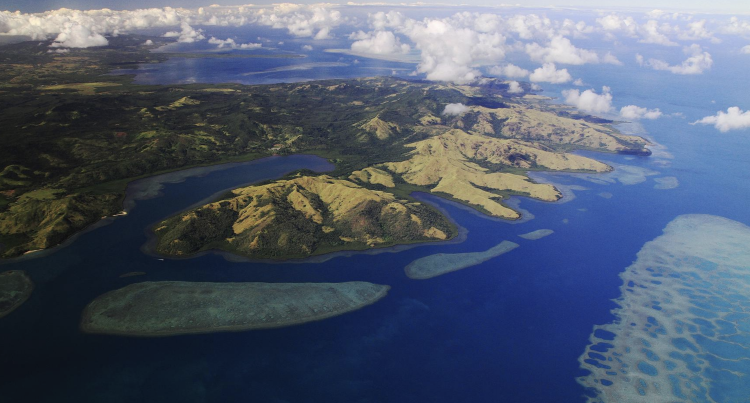 Vanua Levu is Fiji’s second biggest island. This impressive property, known as Tikina-i-ra, is located in the Bua region of the Fijian island of Vanua Levu, and encompasses 4,141 hectares (10,233 acres) of land. The land is zoned for rural use. The property sits on a peninsula some 15 kilometres from what was Dama Airport, which serviced part of the island until the early 1980s, after which it was decommissioned. The Tikina-i-ra property has some 25 kilometres of coastline, made up of sheltered bays, tidal flats with mangroves, and white sandy beaches. A large deep water harbour, Koroinasolo, is located on Tikina-i-ra’s boundary. The property is now being marketed for sale by offers to purchase through Bayleys Real Estate, with tenders closing at 5pm on Wednesday June 5.
was one of the largest freehold landholdings in Fiji. “The vegetation on the property comprises a mixture of pine forest, native forest, coastal mangroves, coconut trees and grassland areas. The property has a mountain peak of around 420 metres (1,380 feet) running through its central spine, with several fresh water springs running down the slopes” Mr Kermode said. “With appropriate approvals, the property could be developed for a hotel or tourism accommodation venture or subdivided into a rural lifestyle estate. Mr Kermode said Vanua Levu, and in particular the western side of the island, was positioned to benefit from economic activity taking place in the wider region. FJD$228m project which has opened up access through the middle of the island,” he said.